Homicide Investigation: Victim of a shooting. DATE / TIME: 3-21-19 / 1249 A.M. LOCATION: 900 Block of E. Fourth St. Pomona, Ca. VICTIM: Name won't be released until the family is notified. 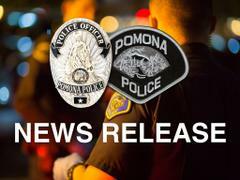 On the listed date and time, Pomona Police officers received a shots fired call-for-service in the 900 block of E. Fourth St. Upon arrival officers located an adult male victim that had been shot. Preliminary information was received that suspect(s) inside a small blue sedan fired at the victim as he rode his bicycle. Sadly, the victim succumbed to his injuries and was pronounced at the scene. Detectives are now on scene investigating.